It’s too late for the sesquicentennial year, but Santa Rosa should declare every April 15 Gus Kohle Day. On that date in 1868 he became a hero for taking his axe to a building on the town square. It was the most exciting thing to happen in Santa Rosa that year; as described here earlier, there was nary a whoop of celebration when the town was officially incorporated. Other than a heated debate over proposed routes for the soon-to-come railroad, it looked like 1868 would be completely forgettable. Then on that mid-April morning, Gus came downtown to open his Court Saloon on Exchange Avenue facing the west side of the plaza (now Old Courthouse Square). There was a commotion because a trio of carpenters and a local farmer were well underway putting up a small wooden building, having worked through some of the night. Gus knew what this was about; everybody in town knew what was going on. The trouble began a few months earlier around Christmas of 1867, when Julio Carrillo couldn’t get a sack of flour. 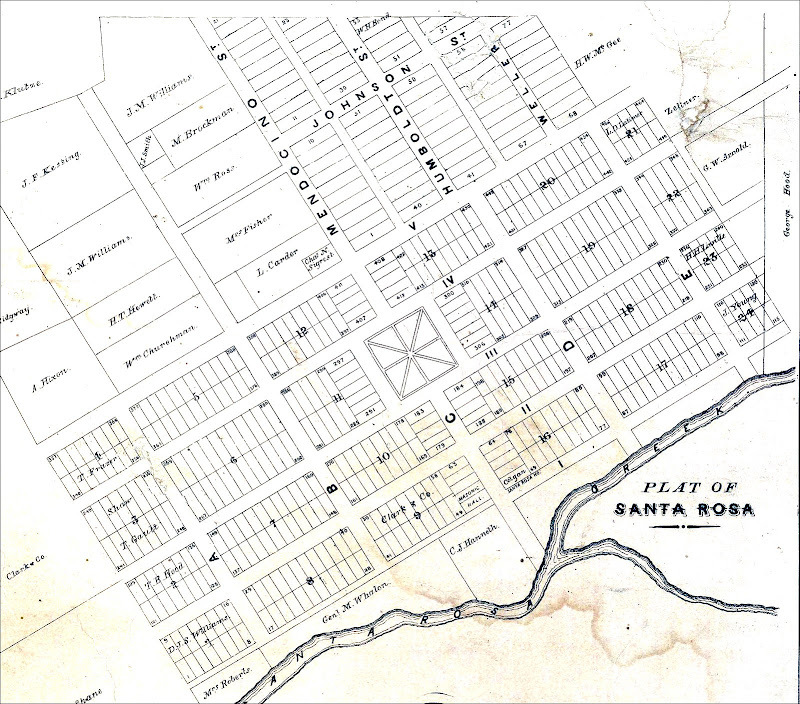 Santa Rosa – as every local schoolkid knows – was built on the 2,000+ acres Carrillo inherited from his mother, Doña María, in 1849. Fast forward a mere five years and the town (albeit unincorporated) was now the Sonoma county seat, thanks in part to Carrillo and the three other founders offering to build a new courthouse here for free. They also donated a couple of acres for a central plaza, with Julio giving the entire western half. At that moment in 1854 he was likely the wealthiest man in Sonoma county after his brother-in-law, General Vallejo. “Stung to the quick, in the heat of his indignation he re-deeded half of the Plaza,” wrote historian Robert Thompson. And typical of Julio’s lousy dealmaking, he took the lowball offer of $300 for what would have been the most valuable property in town. The first news about the “re-deed” appeared in the Santa Rosa paper shortly after New Year’s Day, 1868. Yeah, the plaza was looking a mite scruffy, the editor admitted, but it belonged to the town and “Mr. Carrelio” (his name was misspelled throughout the whole item) can’t un-donate it. The three men who gave Julio the money were all locals – two farmers and a butcher – and they would only “waste their money and make themselves obnoxious to their fellow citizens” by trying to claim ownership, commented the Sonoma Democrat. In March both sides rattled sabers. A crew from the town repaired the fence and installed gates to keep cows and pigs from wandering into the plaza (an ongoing problem) while a San Francisco lawyer, hired by the three who gave the cash to Julio, ordered the work to be stopped. A month later came the showdown. One of those who believed he actually had a valid deed was Wesley Woods (often misspelled Wood), a farmhand who worked for Barney Hoen. The small frame building he and the carpenters were constructing probably had no purpose other than to claim possession of the land. Although this was never a “squatter’s rights” issue, Woods and the others could point to the structure as an improvement on the property, which would complicate legal matters considerably. Woods and the carpenters were arrested. All but Woods were released by the court because they were simply hired workers, but Woods’ San Francisco lawyer got him a jury trial, where he was found guilty and fined $38.75. “This is the first act in the performance. What will be the next step we are not prepared to say,” remarked the Democrat. The group that thought they owned the plaza did not give up, however. Details are sketchy, but they sued to evict Santa Rosa from its own public park – arguing “the town never formally accepted the gift and furthermore, that the conditions precedent to its taking effect have not been complied with.” (Huh?) The court threw out the case. They filed a lawsuit again, this time from Marin county, and again were “non-suited” by the judge. It was now near the end of 1870, probably about two years after they gave the money to Julio Carrillo. The paper stated “an old citizen of the town” tried to smash it up but he “was knocked down and driven out of the enclosure in a very rough manner.” That could have been Gus again, as he still had the Exchange street saloon; but he was 50 years old at the time, and it’s doubtful a reporter would call that elderly (particularly after all the free beer he was pouring down their gullets). Again the shanty was torn down and the men behind it were arrested (Wesley Woods was still the only one named). A trial was held and this time the case was dropped because the work was done at night and there were no witnesses. That was the end of the matter; the town council had rushed through a new ordinance explicitly making it illegal to put up a building in the plaza and they did not try again. Some dangling questions remain. None of those caught in the plaza deal were wealthy, yet they hired San Francisco attorneys – in their last trial, a judge – to represent them. One of the later articles mentions “Wesley Woods, Henry Mutz, and several other parties,” although “A. Berry” was the only other person ever named. Were they selling partnerships to pay for their legal defense? Also, it seems odd that they spent all that money but did not sue Carrillo for fraud. Perhaps Julio – ever the terrible negotiator – did not get his $300 after all because he agreed that the deal would be contingent upon them perfecting the land title. Regardless, the plaza that would become Courthouse Square was safe from being carved up – or at least it was until 1967, when the city split it down the middle with a road. And as explained in my article about Santa Rosa’s centennial celebrations, our progress-minded civic leaders also were planning to sell off the eastern half of the square for commercial development. Preservationists blocked that from happening, thank goodness, but it might have been harder to prevent if we all woke up some morning to find Hugh Codding had built a preemptive shack on the place. * The “sack of flour” angle makes the story seem as if it could be apocryphal, but I think it’s true. Robert Allan Thompson wrote about it just 15 years after the event, and his book was published in Julio’s lifetime. A transcript of the entire passage can be found below. A RAID ON THE PLAZA.— Several years ago, when our flourishing town was in its infancy, it was the recipient of a handsome and valuable gift of a piece of ground, lying ia the heart of the town, for a public square or plaza. Messrs. Hahman and Carrelio were the generous donors. Our old citizens will recollect the high appreciation in which this liberal act was hold at the time. 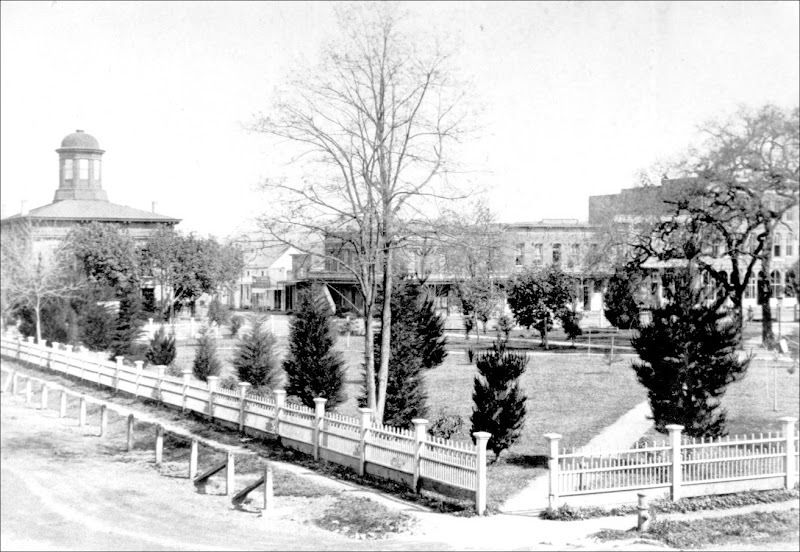 Under the immediate care and personal supervision of Gen. Hinton, since deceased, the plaza became an ornament to the town, and was regarded with pride and pleasure by old and young. Since the old gentleman’s death, however, less care has been given to it, and our public square, though still both a benefit and an ornament to Santa Rosa, is not what it was formerly. This seeming neglect may have operated on the mind of one of the donors, Mr. Carrelio, for we learn he has actually sold and conveyed to certain parties in town all his right, title and interest in the square, and that they design building upon it, leaving simply room for the running of the main street through the same. Of course they will not be permitted to do anything of the kind. We imagine that the “right, title and interest” of Mr. Carrelio in the property mentioned, after donating it to the town for public use, is neither more nor less than that of any other citizen. The parties to whom he conveyed can take no more than he owned at the date of making the deed, which is simply nothing at all. They may possibly, acting under bad advice, waste their money and make themselves obnoxious to their fellow citizens, but in the long run they will be the sufferers by the operation. Santa Rosa, by virtue of a free gift, and long use and occupation, owns the plaza, and under no circumstances will her undoubted right to it be given up. We advise the parties, for their own sake, and the credit of the town, to abandon this vain and unwarranted undertaking. It is only causing ill feeling and useless expense and trouble. UNDERGOING REPAIRS. —The Plaza is undergoing repairs, the fence being straightened up, new gates put in, etc. We understand that the parties now endeavoring to deprive the county of its claim upon the Plaza have ordered the work to be stopped, but no attention has been paid to it. Let the work go on, and the plaza be properly improved. …The attorney engaged for the purpose of taking away the plaza from the town ridicules the idea of the matter being contended, and thinks that all be will have to do for his clients is to go up to Santa Rosa and take possession of it. I think the gentleman will find out that he will meet with more opposition in this matter than be anticipates. ROW ON THE PLAZA.— Late on Tuesday night or early Wednesday morning some parties entered the public plaza of Santa Rosa, and began putting up a small frame building thereon. Daylight revealed the objectionable structure to the gaze of our citizens, and great was the indignation which followed. Marshal Parks proceeded to the spot and arrested Wesley Wood, James Hayward, Edward Minott and William Harrow. Gus Kohle also had a hand in the business. Procuring an axe, he went into the plaza, and in the course of a few minutes completely demolished the new building, leveling it with the ground. The parties arrested were bound over to appear for trial next Tuesday. Three of the parties arrested are carpenters, who were employed to do the work by others who claim the plaza under a bill of sale, as is well known, and have sent to San Francisco for an attorney to attend their case. The people of Santa Rosa have no patience with such nonsense, and those interested in this attempt to grab the public square have made themselves very unpopular. Gus. Kohle, of the Court Saloon, feeling extremely jolly on Tuesday morning last, over his victory gained in the plaza, like the good, clever man that he is, wanted us to feel likewise—so he brought us a keg of Miller & Fried’s superior Lager. Here’s to you, Gus. THE PLAZA WAR.—Last Week we mentioned the arrest of Wesley Wood and three others for unlawfully entering and erecting a building on the public square of Santa Rosa. On Tuesday they were brought to trial before Recorder Middleton, charged with violating a town ordinance. J. W. Owen, of San Francisco, appeared as counsel for the defendants, and P. B. Hood, City Attorney, represented Santa Rosa. The first day was spent in endeavoring to get a jury, great difficulty arising from the line of examination adopted by the defense. The Court finally refused to give the counsel the latitude he claimed in this respect, as it was evident that it would be next to impossible to obtain a jury. Mr. Owen thereupon threw up the case, and left the court room. On motion of the Town Attorney, all the defendants but Wood were discharged. They were simply workmen, and had no intention of committing any offense. Next day the jury was competed, the following persons being sworn to try the case… A verdict of guilty was returned against Mr. Wood. The Court then fined him $38.75, the bare costs of the proceedings. This is the first act in the performance. What will be the next step we are not prepared to say. Why is Gus Kohle so fat, prosperous and good looking? That’s what’s the matter, There is only one reason for it, and that is that he always comes into our office with lager at the proper time. Gus is a brick, sure. More of the Plaza Troubles. The trial of Wesley Wood and others, for breaking down the Plaza fence, etc., came up before Justice Brown on Tuesday last. Judge Tyler, of San Francisco, appeared for tbe defendants, and Barclay Henley and James McGee for tbe city. After an interesting and protracted trial, defendants were discharged. Although several persons were present at the time the fence was removed, not one could be found who had actually seen who did it, or even knew at whose instigation it was done, Tbe impression prevails that it was a put-up job, one party taking down tbe fence before daylight, and the other going to work to erect tbe building shortly after. So far as the merits of the claim to the Plaza go, tbe case remains just where it did before. The City Trustees, however, have passed an ordinance which will make any attempt on tbe Plaza more certain of conviction and punishment hereafter. There are in all cities and towns some peculiar persons who are well known by reason of some phase of character to all inhabitants. Such a person was the late August Kohle, who died on Friday last and was burled on Sunday. He was born in Hanover, Germany, Dec. 10th, 1820, and was therefore at the time of his death in his fifty-ninth year. When a youth he shipped from Bremen as a cabin boy and went to Havanna, [sic] where he remained twelve years. In 1849 he came to California and in 1859 settled in Santa Rosa, where be subsequently married and has since resided. By industry as a laborer, brick manufacturer, etc., he accumulated considerable property and at one time owned most of the frontage on the west side of the Plasa. At an early day he took great interest in the improvement of the Plaza, and as Sexton did most of the work in laying out and improving the Cemetery grounds. He was also an original member of the Fire Department, and served many years as Steward of Engine Co. No 1, being at all times one of its most active and efficient members. To attend meetings, and wear the uniform on gala days, was not with him the whole duty of a fireman. Be took hold of whatever would promote the efficiency of his company, whether in the heat of battle with the flame, or in work about the engine and its appurtenances, that it might at the first tap of the alarm bell be ready for any emergency. Gus Kohle had his faults—who has not? but during his long residence here made for himself a good name. He was industrious, charitably disposed, honest in dealing with his fellow-men, and always made good his Word. His sphere was humble; his opportunities were slight; but in spite of these drawbacks he died respected by all who knew him, as was evidenced by the very large attendance at his funeral of the citizens of Santa Rosa, without regard to creed or nationality. He has laid aside the burden of life. His memory, like his face, will soon fade from the minds of men, but he will be remembered by all who have been associated with him in the department as a faithful fireman. He was also a member of the Pioneer Association of Mendocino, Sonoma, Napa and Marin counties, and of the German Club of this city. The companies composing the Fire Department, and the German Club, in a body, escorted his remains to the Cemetery. At his special request his funeral was conducted by Santa Rosa Engine Co. No. 1. At the grave the German Club united in singing “Des Freundes Abschied”—The Friend’s Farewell—and the remains were committed to the grave. A wife and three children mourn the loss of a kind and affectionate husband and father. As an old citizen and member of the Fire Department we pay this tribute to his memory. …One day he sent [sic. went] to a prominent merchant of the city, and was refused credit for a sack of flour. Stung to the quick, in the heat of his indignation he re-deeded half of the Plaza to Henry Mutz, Wesley Wood and A. Berry for $300 in cash. These parties endeavored to take possession of the property, but were prevented. The matter finally got into the courts, and was decided in favor of the county, to which Carrillo had originally given the land. He claimed, when he re-deeded it to Mutz, Wood and Berry, that the conditions of the gift to the county had not been fulfilled. The case was tried in Marin, and the title of the county to the land was fully sustained.